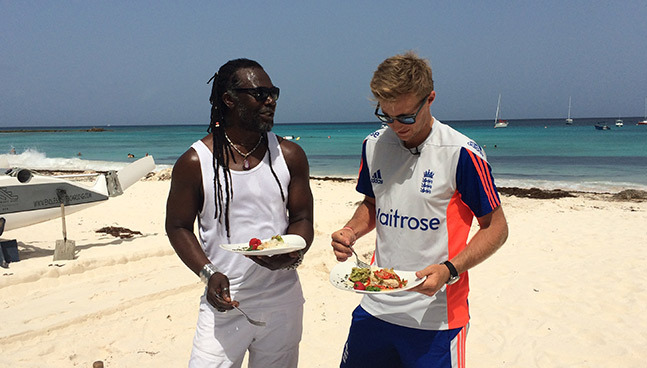 Find out what happens when cricket meets food on a beach in Barbados! As the England Team prepared for the 3rd Test of a competitive series in the West Indies, Waitrose took musician turned sauce entrepreneur Levi Roots along to meet England’s star batsman, Joe Root. Fresh off the back of his match winning innings in the 2nd Test, Joe was challenged by Levi to whip up a delicious West Indian fish parcels recipe before the Yorkshire and England star then passed on a few of his batting tips in a fun game of beach cricket. Click on the video below to discover more as the pair chatted about their music tastes, memories of cricket in the West Indies and food inspirations. And discover what happened when they challenged each other to a Scotch Bonnet tasting!